Recorded in many spellings, this interesting surname is of French origins. It is recorded throughout Europe in over fifty different spelling forms. These include the traditional Guy and Guye, with diminutives such as Guiet, Guihen, Guyon, and prejoritives such as Guihard, Guignard, and Guignot (French), Guida, Guidara, Guidera, Guido (Italian), and many others such as Gie, Wi, or Why in England. However spelt and in whatever nationality it is found, in most cases the surname shares the same origins. These are that it may originally have been an occupational name for a professional guide, a very important role in the ancient times when such maps as existed were not to be trusted, as were the signposts or marker stones, which had survived from Roman times. This derivation is from the pre 10th century Old French word "gui" meaning a professional guide, as in John le Gy, in the Subsidy Rolls of Essex, England, in the year 1327. 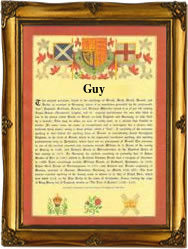 Secondly the name may derive from the personal name 'Guy'. This is derived from the pre 7th century Germanic name "Wido", of uncertain meaning. In England a possibility is that the name may derive from the word "widu" meaning a wood, and therefore be residential for one living by such a place. The first recorded spelling of the family name anywhere in the world is believed to be that of Richard Wi. This was dated 1188 in the the Pipe Rolls of the county of Oxfordshire, England. Throughout the centuries, surnames in every country have continued to "develop" often leading to astonishing variants of the original spelling.